We pretty much tried to cover all the basics of your “thank you” needs. This list will serve you all year long! 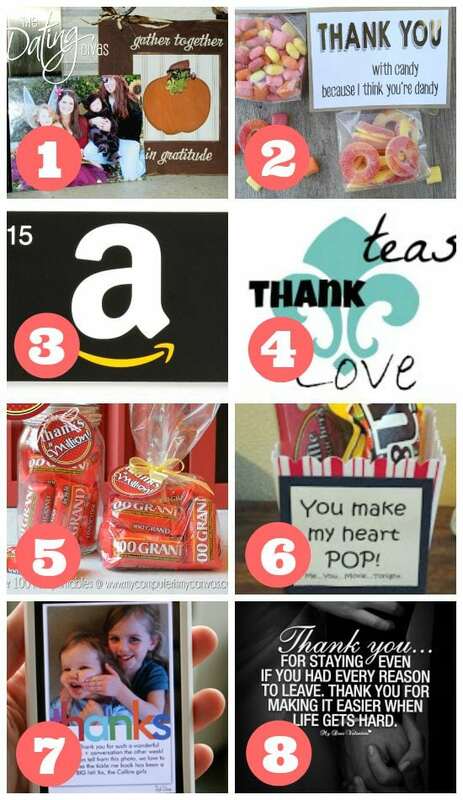 Let your spouse know how grateful you are for everything he/she does using these great “thank you” ideas! 1. 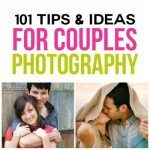 10 Ways to Give Thanks to Your Spouse by The Dating Divas – Use one of these great ways to show gratitude to your spouse. 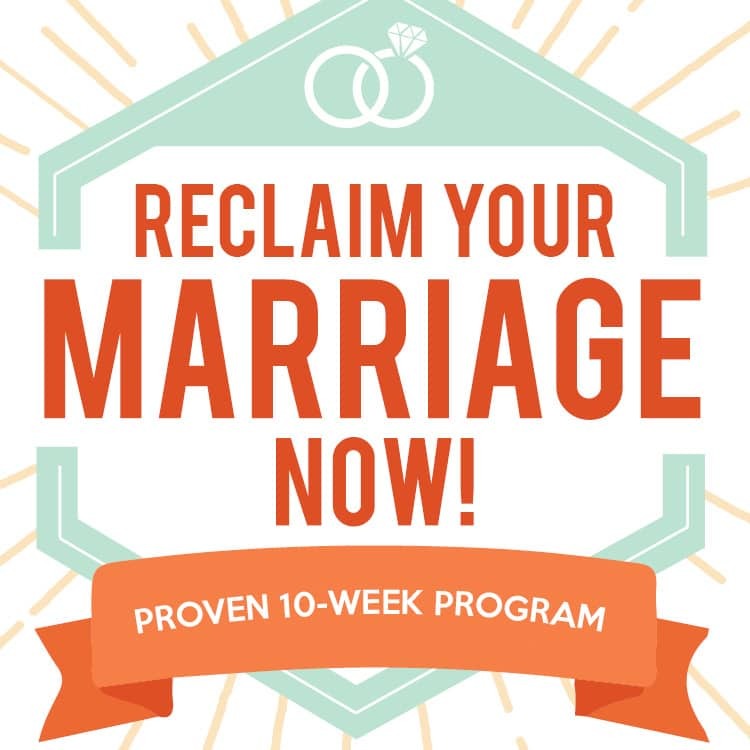 PLUS, if 10 ways aren’t enough – how about 101 Ways to Show Gratitude to Your Spouse?! 2. I Think You Are Dandy by No Biggie – Use this cute “thank you” note attached to candy to tell your spouse you appreciate all he/she does. 3. Thanks for Being so AMAZ’ON by The Dating Divas – Our wonderfully talented Becca came up with this creative gift to your spouse. Make a cute card for your spouse with this saying on it and then get your spouse an Amazon gift card to go with it. So much fun! 4. Thank You Through Texts by Satisfaction Through Christ – Text your spouse a great “thank you” to show your gratitude for his/her awesomeness! 5. Thanks a Million by My Computer is My Canvas – This is such a cute design with a fun gift for your spouse using 100 Grand Bars! Use this fun idea to show gratitude to your spouse. 6. 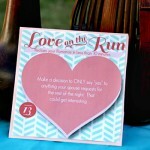 You Make My Heart Pop by One Crazy Cookie – Put a little “thank you” gift together using a popcorn holder with this cute saying on it, then write a fun card to show your love and gratitude to your spouse. 7. Red Stamp by Mom Filter – Download this fun app on your phone to create a gorgeous “thank you” card to show gratitude for your spouse. 8. “Thank You” Picture by My Dear Valentine – Give your spouse this great gift to express your emotions of thankfulness and love. 9. 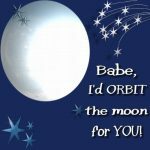 Thanks for Sticking by My Side by Six Sisters’ Stuff via The Dating Divas – Show your spouse how grateful you are for him/her with this cute printable card and chap stick. 10. “Thank You” Statements by Love and Respect – Use one (or more!) of these gratitude statements to show your spouse you are grateful for him/her. 11. You Are My Favorite by Shine Your Light – Use awesome chalkboard lettering to say “thank you” to your spouse. 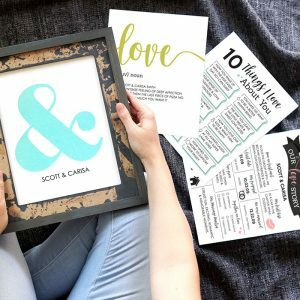 We’ve even got an adorable printable if you’re looking for some fun home decor – use it for a 27 Days of Gratitude Challenge! 12. Candy Bar Thank You Sayings by The Dating Divas – Use these cute “thank you” cards with their paired candy to show your spouse gratitude. 13. 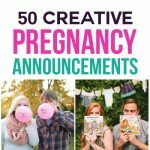 Thankful Jar by The Realistic Mama – Turn this idea into a thankful jar for you and your spouse to use all year long. Fill it up with the reasons why you are so grateful for all he/she does. Love the idea of DIY jars? We’ve got an adorable Giving Jar, too! 14. 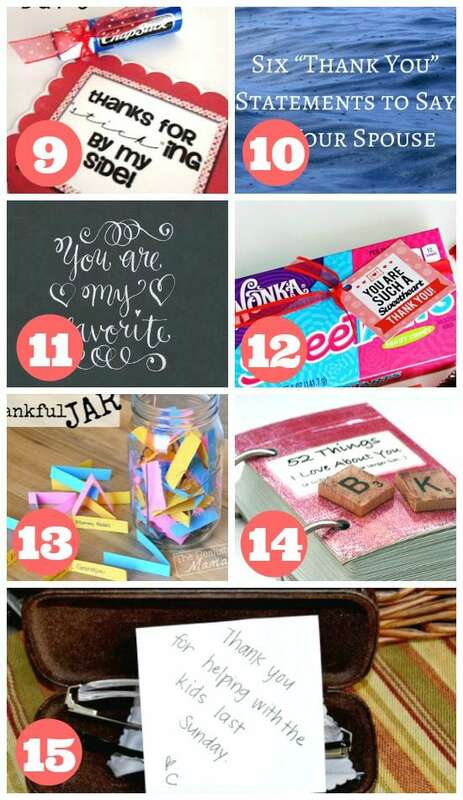 52 Reasons I’m Grateful for You by Dollar Store Crafts – This is such a cute love idea – take it and adapt it so it is a grateful idea for your spouse. Instead of just naming 52 ways you love your spouse, write down 52 reasons you are grateful for your spouse. It is a perfect way to show your gratitude. 15. 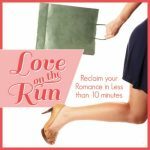 Hidden Thank You Notes by The Dating Divas – Hide some “thank you” notes in places your spouse will easily find to show how grateful you are. 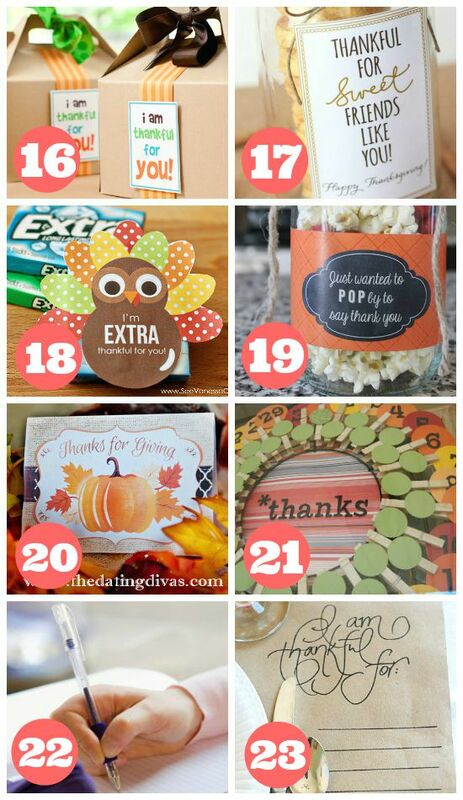 These 15 ideas include thank yous for you to use for Thanksgiving (which is the perfect holiday to highlight! ), a few Christmas thank you ideas, and a super important holiday – Veterans Day. We have so many readers (and even Divas!) that are military spouses, so we felt the perfect thing to do was include a few ideas to say “thanks” to those who work daily at keeping this country free! 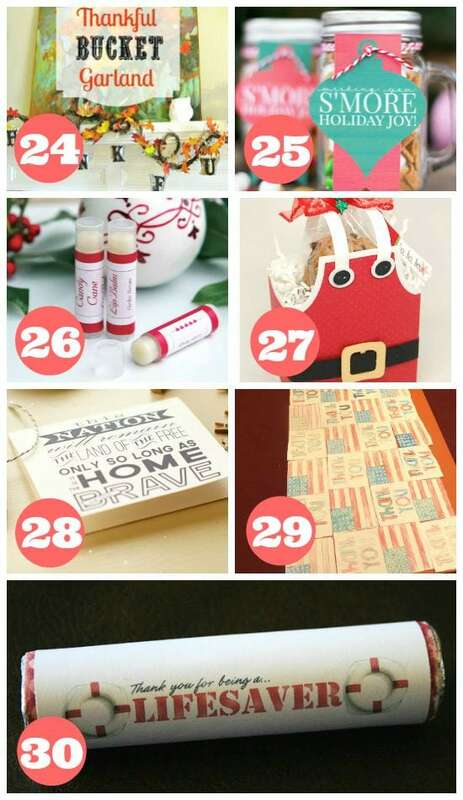 We are so blessed, so use these ideas to thank some Veterans! 16. Thankful for You Boxes by The Party Wagon – Use these adorable Thanksgiving thank you boxes (you can grab similar ones here) for your Thanksgiving festivities this year. 17. Thankful for Sweet Friends Like You by Lil’ Luna – Make these yummy cookies around Thanksgiving to show your gratitude. 18. I’m Extra Thankful for You by See Vanessa Craft – This is an adorable turkey printable with a pack of Extra gum to use during Thanksgiving. 19. Pop by to say “Thank You” by Simply Clarke – Make a simple and yummy treat to say “thank you” to your family or friends with this cute gift of gratitude. 20. Thanks for Giving Printable Card by The Dating Divas – This is a perfect card to use for your fall holidays this year to show your gratitude for everything you have. 21. Thank You Wreath by Magdalene – This is an awesome thank you idea. Make this wreath to use on Thanksgiving Day so everyone who comes to dinner can pick a reason why they are grateful this year. 22. 30 Days of Thank You Cards by Someone Else’s Idea – Send a card to family, friends, neighbors, or co-workers every day for the 30 days before Thanksgiving to tell the people in your life you appreciate them. 23. I Am Thankful Placemats by Cottage in the Oaks – Use these fantastic thankful placemats for your holiday celebration so your guests can reflect on what they are grateful for in their lives. 24. Thank You Garland Buckets by Blog Her – Create this beautiful garland out of these galvanized buckets to show others that you are thinking of them this holiday season. 25. S’more Holiday Joy by A Night Owl – Create this perfect holiday thank you gift to show your gratitude during the Christmas holidays. 26. Candy Cane Chap Stick by Evermine Occasions – Make your own candy cane chap stick using ingredients like beeswax pellets and these fun tubes as a small thank you gift for those in your life. 27. Santa Thank You Box by My Time, My Creations, My Stampendence – Make this cute box out of card stock and fill it with anything you want to say “thank you” to someone special in your life. 28. Land of the Free by The Neighborhood – Use this card to show your gratitude to the veterans who keep us free. 29. Thank You Quilt for Veterans Day by Tunstall’s Teaching Tidbits – This is an amazing and perfect idea to say “thank you” to our veterans for their sacrifice for our freedom. 30. Thank You for Being a Lifesaver by Me and My Insanity – Oh my goodness – what a fantastic way to say “thank you” to our veterans on Veterans Day. Show your gratitude with this cute gift. Awesome! Bringing a baby into this world is a very special event. Say “thank you” to the professionals who help make that happen! 31. Taking Care of Our Little Nugget by Pomp and Circumstance – Get a bag full of Hershey’s Nuggets to say “thank you” to your hospital staff for your little nugget! 32. DONUT Know What We Would Do Without You by Make, Bake, Celebrate – Get a box of donuts with a cute little thank you note to show your gratitude for your doctor and delivery nurses. 33. Thank You Candy Bar by A Girl and a Glue Gun – Put these awesome wrappers on some candy bars to show some gratitude to your hospital staff. 34. Thanks for Helping with Our Little Peanut by Carolina Charm – Use some great peanut M&M’s with a cute tag to say “thank you” to your doctors and nurses. 35. Thank You Hospital Cookies by Sweetopia – These cookies are a perfect way to say “thanks” to the professionals of your delivery! 36. 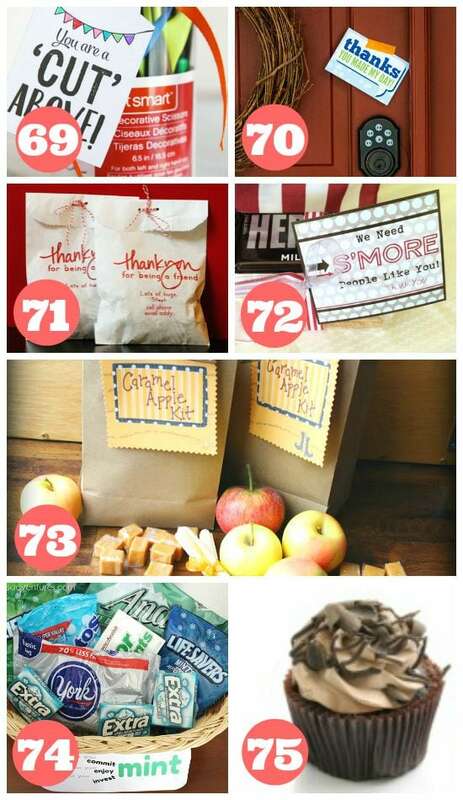 Thank You Bags by Unoriginal Mom – Put together these great thank you bags as a way to show your gratitude to those who help bring your baby into the world. 37. Thank You for the Helping Hand by Keeping it Simple – Get some hand soap, attach the cute thank you note, and voila – awesome notes to your doctor and nurses. 40. Thank You Jars by Design Dining Diapers – Use some jars filled with goodies for your personal staff at the hospital. 41. Thanks for Taking Care of Me and My Sweet Pea by Sometimes Creative – These are cute gift bags filled with sweet pea themed gifts for your doctors and nurses at delivery. 42. 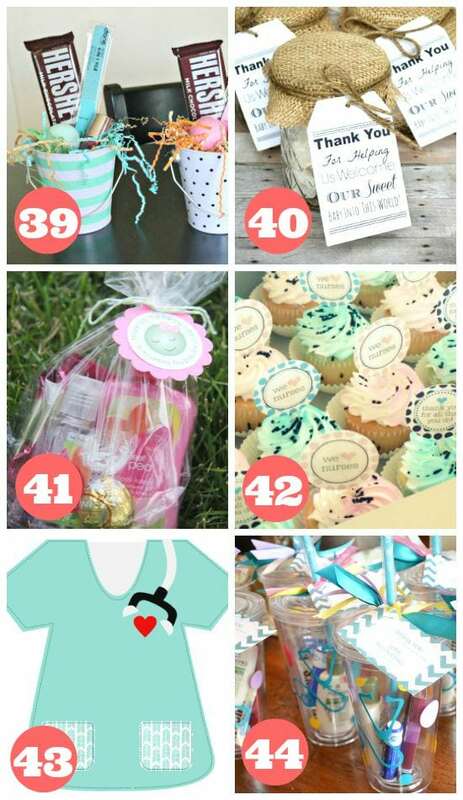 We Love Nurses by Somewhat Simple – We love the gorgeous tags to add to your celebration and gratitude for welcoming a new addition to your life. 43. 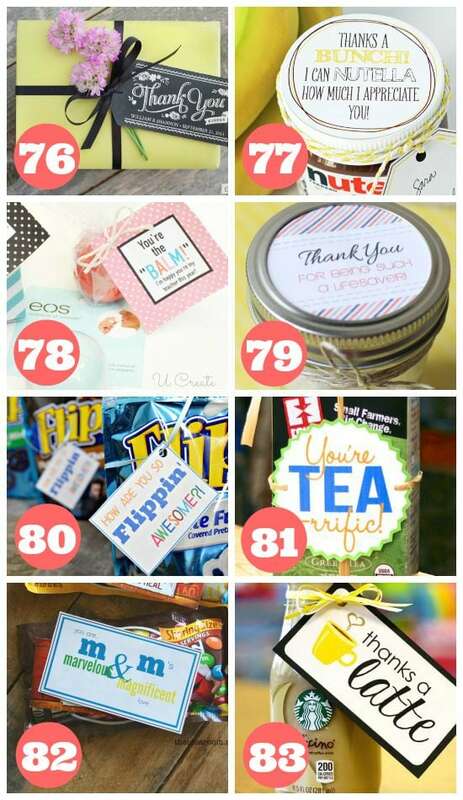 Nurse Scrub Tag by One Year of Pinterest – Write “thank you” on this wonderful gift tag to show your gratitude to your hospital staff. 44. Thank You Tumblers by The Rodimels – You aren’t the only one who needs a drink during your labor and delivery! Get some awesome tumblers for your hospital staff, fill them with travel sized hand sanitizer, lotion, chap stick, and maybe even a treat or 2 to complete this thank you idea! 45. Ask for Advice by Life as Mama – Now, I know this could seem like a weird idea to put on this list, but don’t you feel flattered when someone asks you advice? Show your gratitude to your nurses by asking the best way to swaddle you new baby, some good burping techniques (trust me, there is more than one way to burp a baby! ), or even some favorites on baby items (like shampoo or lotion). Your nurses will feel trusted and appreciated when you use this idea. Oh, and don’t forget to throw in a verbal “thank you” too! LOL! 46. Thank You with Food by Life as Mama – I know this is another simple idea, but it’s so effective! If you are super on top of things, you can bake some cookies or cupcakes to bring with you to the hospital. If not, order in some pizza or deli sandwiches while you are staying at the hospital to show your gratitude to the doctors and nurses. 47. Thank You Basket by Audrie I’s – Take in a basket of goodies for your nurses to pick and choose their favorites. What a great thank you idea! 48. 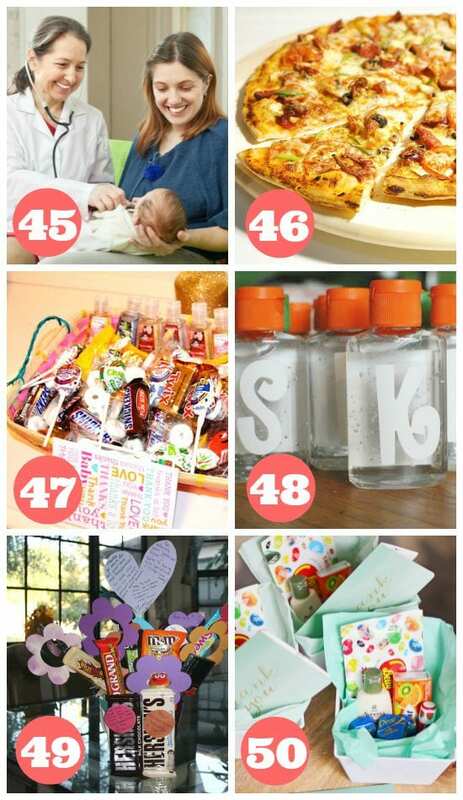 Monogrammed Hand Sanitizers by Random Thoughts of a Supermom – Use this cute thank you idea for your labor and delivery nurses, but monogram your baby’s name on the bottle or the letter of your last name so your nurses remember who gave them the awesome gift! 49. Candy Bouquet by Lindy Downs – Create a fun candy bouquet to show your gratitude on your big day! 50. Thank You Boxes by The Modern Tulip – Make a cute gift box for each hospital staff to show your gratitude for their help in bringing your bundle of joy into this world. Keeping up good relationships with your neighbors is a good thing. 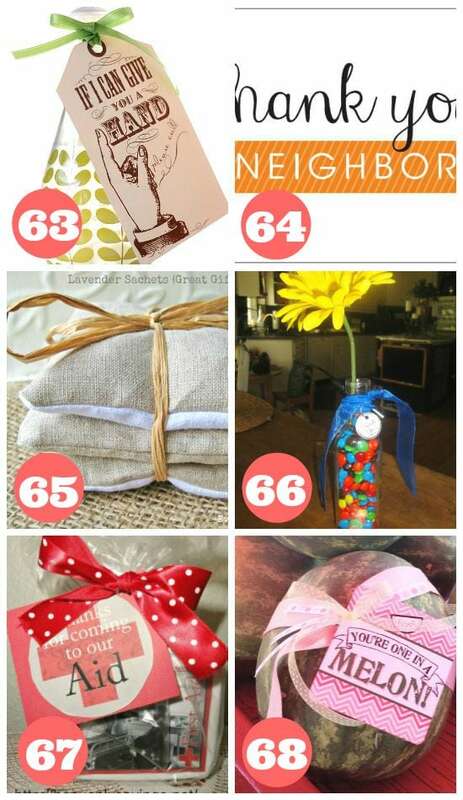 Use one of these fun thank you ideas to show your gratitude to a good neighbor. 51. 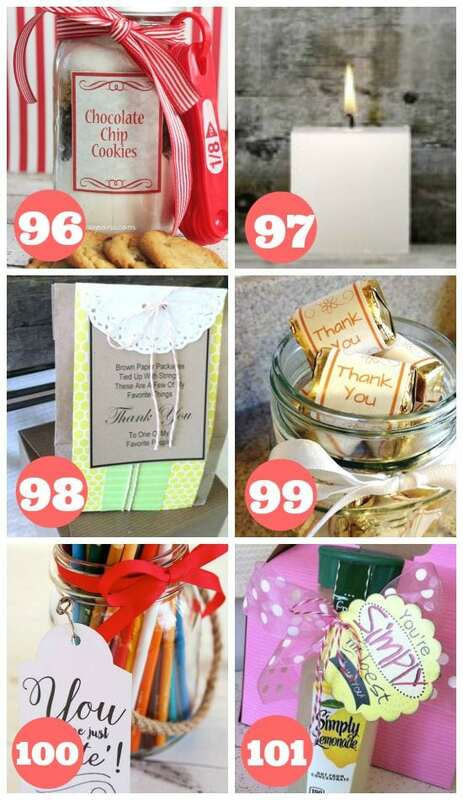 Bucket of Thanks by Crazy Little Projects – Make this cute gift bucket for your neighbor for a great thank you idea! 52. Thank You Herb Gift by A Night Owl – Get a gift that literally keeps on giving with a cute herb basket and note attached as a fun gift of gratitude for a neighbor. 53. 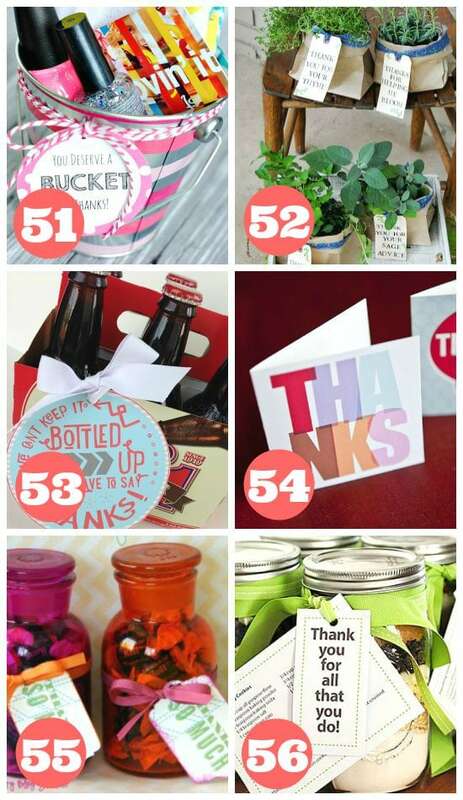 Can’t Keep It Bottled by Moritz Fine Designs – Use this fun thank you idea the next time you need to say “thanks” to a neighbor! 54. Thank You Notes by The Neighborhood – Sometimes there’s no better way to say “thank you” than with a good ol’ handwritten note. 55. 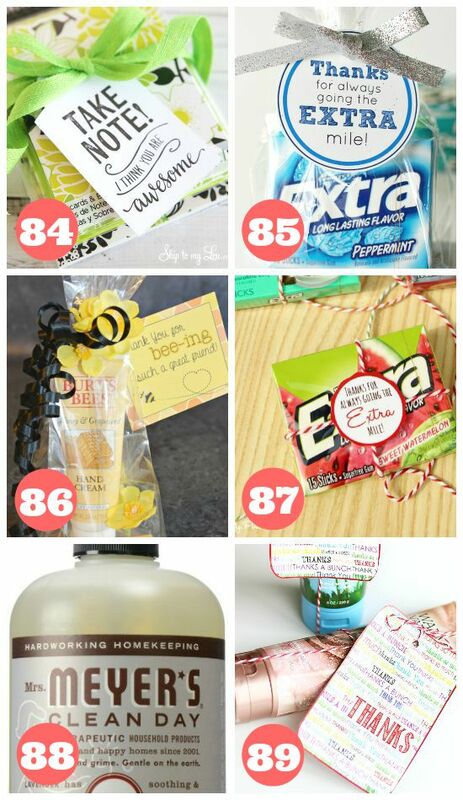 Thank You So Much by The Crafty Blog Stalker – Get a cute bottle, fill it will some yummy potpourri, add a little thank you tag for the perfect neighbor gift idea. 56. Thanks for All That You Do Cookies by She Wears Many Hats – Put this yummy cookie recipe in a jar for a show of gratitude to your neighbor. 57. Thankful for You by Eat, Sleep, Make – Make some delicious bread and attach a cute printable card for a fun way to say “thanks” to a neighbor. 58. Thanks for Being a Lifesaver by My Computer is My Canvas – If you have had a neighbor come help in a time of need, use this fun thank you idea to show your gratitude. 60. Thank You Cookies by A Girl and a Glue Gun – Make a batch of cookies and put them in individual CD sleeves like these that say “thank you” to your awesome neighbor. 61. You’re the Best of the Bunch by Thirty Handmade Days – Make some yummy banana treats with a cute printable card to thank a great neighbor friend. 62. Extra Special Gum Bouquet by Home Made Interest – This is a super easy and cute thank you gift using yummy Extra gum – perfect for any neighbor! 63. If I Can Give You a Hand by Skip to My Lou – Do you have a super helpful neighbor who never asks for anything in return? Give him/her this cute thank you gift and add a handwritten “Thanks for all you do, let me return the favor sometime,” to show your gratitude for his/her awesome attitude. 64. Thank You Neighbor by The Neighborhood – Use one of these cute thank you cards to let your neighbor know you are grateful. 65. Lavender Sachets by Everything Etsy – Make these adorable lavender sachets as a great thank you gift for a neighbor. 66. Flower and a Treat by The Budget Diet – Put this cute vase together and add a quick thank you tag for your neighbors. 67. Thanks for Coming to Our Aid by Heavenly Sayings and Homemaking – Put this cute thank you gift bag together for a neighbor who helped you out. 68. One in a Melon by Studio 5 – Attach this cute note to an actual melon as a healthy thank you gift for your neighbor. 69. You Are A “Cut” Above by Skip to My Lou – If you have a creative neighbor then this is the perfect thank you gift for them. They will be so appreciative of the thoughtful gift. 70. Thanks, You Made My Day by The Neighborhood – Leave this thoughtful note on a neighbor’s door to show your gratitude for being a great neighbor. 71. Thank You for Being a Friend by The Daily Digi – Print off these cute thank you gift bags, fill them with a quick gift as an easy way to say thank you to a neighbor. 72. We Need S’more People Like You by Studio 5 – Everyone loves s’mores! Give the ingredients with this cute saying to a neighbor for an adorable thank you gift. 73. Caramel Apple Kit by Pebbles and Piggytails – Put this fun kit together and give as a thank you gift to a neighbor. 74. Thank You Mint Basket by Christina’s Adventures – Put this minty fun basket together to say “thank you” to a neighbor. 75. You Take the Cake by The Budget Diet – Bake or buy some cupcakes and add a cute note saying “You take the cake” to express your gratitude to your awesome neighbor. Friends are very important people in our lives. Keep your friendship alive by using one of these wonderful thank you gifts. 76. Chalkboard Thank You Tags by The Elli Blog – Use these awesome thank you tags to finish off your gift for your friends. 77. I Can Nutella How Much I Appreciate You by Landeelu – Get a container of Nutella and add this adorable tag to it to make a great thank you to a friend. 78. You’re the Balm by U Create – Use your favorite lip balm and attach this amazingly cute printable tag to it for a great thank you idea for your friend. 79. Thank You for Being Such a Lifesaver by Girl Creative – Put a great gift together for a friend to let them know they’re your lifesaver. 80. So Flippin’ Awesome by Mother’s Niche – Turn this yummy snack into a great thank you gift for a friend. 81. You Are so TEA-Rrific by Fair & Square Blog – Herbal teas are so great and be just what a person needs to get them through the day. Give your friend a great thank you gift using some great teas. 82. Marvelous and Magnificent by The Idea Room – Turn an ordinary bag of M&M’s into a wonderful thank you gift to a great friend to show your gratitude. 83. Thanks a Latte by Kindercraze – Give your friend a yummy drink and a fun note for a good thank you gift. 84. Take Note – I Think You Are Awesome by Skip to my Lou – Get an adorable note pad and use this cute saying for a great thank you to a friend. 85. 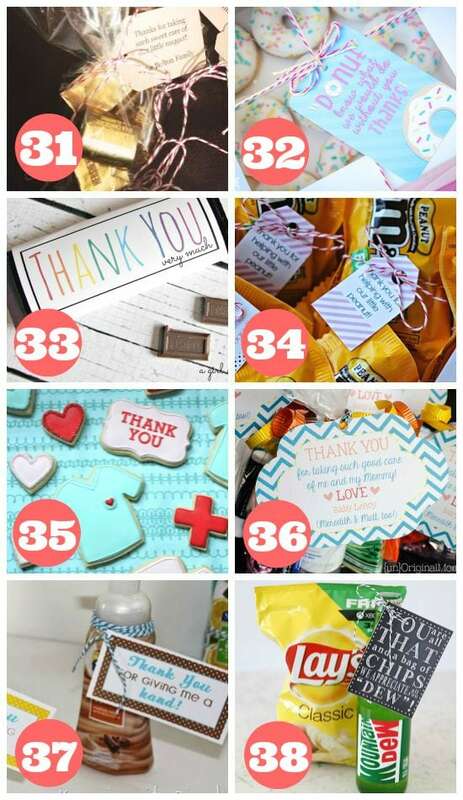 Going the Extra Mile by Pennywise Mama – This thank you idea is super easy – grab a pack of Extra gum, attach a note, and voila – perfect thank you gift for a friend. 86. Bee-ing Such a Great Friend by About a Mom – Make a useful gift idea with some awesome Burt’s Bee’s products and great thank you note. 87. 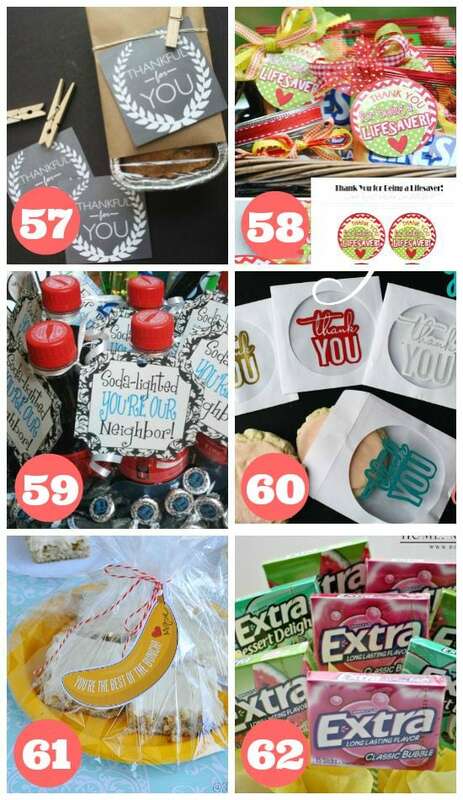 You Are EXTRA-Ordinary by Play Party Pin – Use some Extra gum as a great way to show your gratitude to a wonderful friend. 88. SOAP’in You Know How Much I Appreciate You by The Dating Divas – My fellow and amazingly talented Diva Becca, came up with this adorable saying… use it for your next thank you idea to a friend. 89. Thanks Subway Art Tag by Blooming Homestead – Use this thank you tag to attach to your next gift – there are a variety of ways you can use it. 90. You are Scent-Sational by Skip to my Lou – Get some yummy smelling salts and turn them into a great way of showing gratitude to your friend. 91. 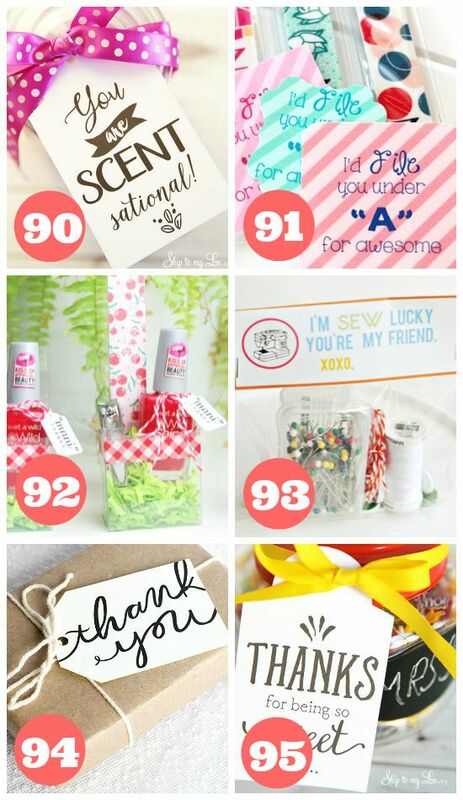 “A” for Awesome by She’s Kinda Crafty – Use a nail file and this printable card for a great thank you gift to a friend. 92. Mani Thanks by Crafts Unleashed – Make mini manicure set for a great thank you gift to a friend. 93. Sew Lucky You Are My Friend by Thirty Handmade Days – Give your crafty friends a cute sewing kit for a great thank you gift. 94. 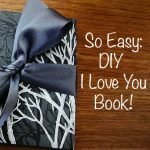 Thank You Tag by The Pretty Blog – Sometimes all your great thank you gift needs is a classic thank you tag to show your full gratitude. 95. Thanks for Being so Sweet by Skip to my Lou – Fill a jar full of your friend’s favorite snack or treat for a thoughtful thank you gift. 96. Cookies in a Jar by Raining Hot Coupons – Put this mix of chocolate chip cookies together as a thank you to a friend so they can make some yummy goodness whenever they’d like. Seriously, who doesn’t love cookies?! 97. No One Holds a Candle to You by The Budget Diet – Buy a candle and attach a card with this cute saying on it to show your gratitude to your friend. 98. 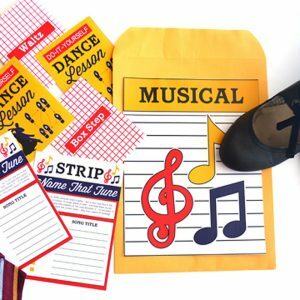 Brown Paper Packages by Studio 5 – Fill a brown paper bag with a handful of goodies, attach a printable card to it, and give it to one of your favorite friends as a great thank you gift. 99. Thank You Nuggets by Soda Pop Ave – Buy your friend’s favorite bite sized chocolates, wrap them in the awesome thank you candy wrappers for a sweet way to say thank you! 100. You Are Just Write by Skip to my Lou – This is a great thank you gift for your friend who is super crafty or a great artist. These pencils will speak right to her soul. 101. You’re Simply the Best by Studio 5 – Get a ‘Simply’ lemonade or other drink and attach a cute note saying “You’re Simply the best….thank you” as a great way to show your gratitude to a friend. 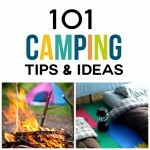 Aren’t all these ideas awesome?! 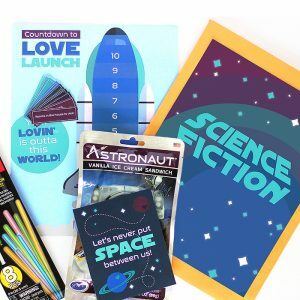 If you like this post, check out our first post of 101 Ways to Say Thank You or maybe you need a teacher appreciation gift… check out these 101 Quick and Easy Teacher Gifts for all your needs! And if you want to fill your home with feelings of gratitude for the season, we even have 10 Printable Quotes for your wall!